This activity is UNAVAILABLE during winter and will resume in spring. 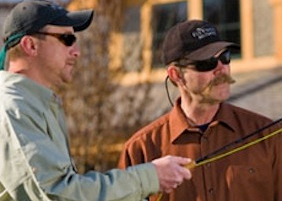 Polish your fly-fishing skills with expert guidance from our professional instructors. 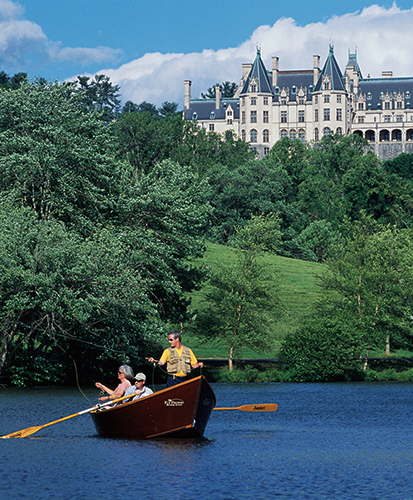 Biltmore is an Orvis-Endorsed Fly-Fishing School. Call us for details and reservations. Spend two hours learning the basics of casting and then fish from a drift boat in the lagoon if time allows. All equipment provided. Minimum age is 12 years. Learn the basics of fly-fishing and casting, including equipment, fly presentation, landing the fish, fly selection, and knots from our expert guides and then fish from a drift boat in the lagoon. All equipment provided. Minimum age is 12 years. Cost: $225 per person for four-hour instruction per instructor. Have the children enjoy spin fishing at our lagoon. Ages 7 to 11 (must be accompanied by parent or guardian). Cost: $125 per person. Maximum two kids per instructor. No fishing license required. Two-day advance reservation is required. 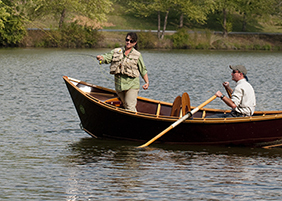 Choose from a guided half-day adventure fly-fishing on our lagoon from a drift boat, a guided half-day adventure float trip on the French Broad River for smallmouth bass, or an exciting guided full-day wade trip fishing for trout in one of our local streams or rivers. Fly-fishing experience is required for half-and full-day adventures. All equipment provided. Fly-fish for smallmouth bass and pan fish on the French Broad River in a drift boat oared by one of our expert instructors. Experienced fly-fishing anglers only. NC fishing license required on French Broad River. Enjoy a guided wade trip on local rivers stocked with trout. Lunch from an estate restaurant provided. Experienced fly-fishing anglers only. NC fishing license with trout stamp required. *Prices are in addition to estate admission and subject to change and applicable tax.